May 28, 2010 0 comments on "Black Spots on Roses"
Depending on the climate where you live, you may have a problem with black spot, a fungus that can weaken rose bushes. Here are some expert tips to help keep this fungus in check, and get rid of those black spots on roses. Prune the trees and hedges surrounding your rose garden. Pruning allows sunlight and breezes to quickly dry the foliage after morning dew or rain. This helps promote circulation and light penetration. Keep other plants at a distance to allow maximum exposure of the rose foliage to sunshine and air. Watering the soil with a soaker hose will keep the leaves dry and eliminate the need for overhead irrigation. Black spot spores need water on the leaf surface to germinate. Cankered rose stems bear black, dead areas that harbor the fungus over the winter. Prune them out, preserving more vigorous healthy canes. This prevents infection of spring foliage. Apply lime sulfur just before bud break in spring. This treatment delays the onset of black spot and powdery mildew infections for several weeks. Apply a fungicide based on neem seed extract beginning when leaves are fully expanded. Neem products are not as toxic as conventional fungicides and have the added benefit of controlling many rose insect and mite pests. They only work to prevent new infections, so spraying must be done on a weekly basis as long as weather is humid or wet. Apply conventional fungicides as a last resort. If the weather is dry in early summer, and you have applied neem every week, you may not have a black spot problem at all. If you miss an application, or daily rain and dew create ideal fungal infection and growth conditions, you may need to use a conventional fungicide. Use a fungicide containing chlorthalonil, thiophanate methyl, or propiconazole. It’s best to rotate different fungicides. Never using the same one two times in a row prevents the fungus from developing resistance to the fungicides. You can, fortunately, tolerate some damage, especially late in the season. Heritage and antique roses generally bloom in late spring and bloom only sporadically throughout the rest of the season. In July and August, with the flowers gone, the plants attract little attention and some black spot can be tolerated without permanent harm to the plants. Like this article? 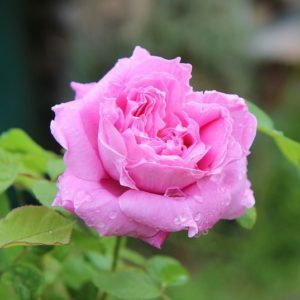 Check out my articles on when to plant roses and tips for growing beautiful roses.